166th Carnival of Education arrives THIS Wednesday 4/2! Inspiration Wanted! The 166th Carnival of Education will be held here THIS Wednesday, April 2, 2008. Submissions are already pouring in, and I certainly have my work cut out for me. You can submit here at Blog Carnival before 6:00 pm CST on Tuesday, April 1st. I've already received submissions on a wide range of topics, and I will cover many of them, but I'm going to put out a request for something I would like to see more of: inspirational stories from teachers. This is the time of year when new and veteran teachers alike need all the inspiration they can get. What I'm really asking is: why do you teach? What makes you get up and continue doing it each school day? Sometimes I have to remind myself that the name (and purpose) of I Want to Teach Forever comes from my answer to this question. Read the 165th Carnival of Education at Bellringers and the 164th COE at So You Want to Teach? to read some truly fascinating entries from across the spectrum. Today during Saturday tutoring, I played my Graph BINGO Review Game with an entirely new set of students. These were 9th and 10th graders, none of whom were my students, and they enjoyed the game and learned as much as my students had a few weeks ago. While I was preparing I had an idea for an extension. I erased all of the graphs and created a blank bingo card with plenty of space in each box. I thought that if the game didn't last very long, I could ask students to create their own bingo card and call sheet with various types of graphs. Then we could copy the best one and play a brand new game as a whole group. You could also practice negative statements, the kind they love to frustrate students with on standardized tests, like "which graph does NOT have a positive y-intercept?" The problem with any game or activity like this, of course, is that you can't keep using it again and again. The novelty of any good idea wears off quickly. In fact, bingo will probably be retired for the rest of the school year, only to rise again triumphantly for 2008-2009. Every Tuesday and Thursday during my conference period I tutor a group of my LEP students who need extra help to pass the TAKS test. We were told that these sessions had to be fun and engaging (as if I wasn't trying to do that already), so I decided to test out an idea I hadn't been able to work into the curriculum. Last semester I used the Statue of Me activity to teach proportional change with moderate success. More recently I incorporated it into our Measurement Project, and again we were somewhat successful. However, despite our efforts, student struggle with proportional change when it is expressed as a scale or ratio (and visualizing these changes) year after year. So I thought I'd use toy cars, like Matchbox Cars or Hot Wheels (both owned by Mattel), and real cars to help my students visualize these changes. Materials Needed: The cars cost about $5 for a pack of 5, although if you have children you might be able to "borrow" some for free. Introduction: I started by showing students a video entitled Designing Toy Cars from The Futures Channel, a free educational video website that focuses on connecting math and science with the real world. Most of the videos are succinct, 2-5 minute clips that provide background for a supplemental lesson plan they provide. In this video, a Mattel toy car designer explains the process of creating a toy car, from measuring the dimensions to the scale (1/64) used to create realistic looking cars. After the video ended, I asked about what type of math the designer was talking about (proportions, measurement, scale), and what was the scale they used. Then I showed them my toy cars, and explained that we would use this information to find out the size of the real car. Guided Practice: Students worked in pairs to measure length, width and height (from the ground to the highest point) of a toy car to the nearest eighth of an inch. I asked a volunteer group to share their results, and we discussed how we would use the scale (1/64) to figure out the size of the real car. They debated over dividing or multiplying and by what, before settling on multiplying by 64 (if they decide on something else, have them try it out and discuss the reasonableness of their results). Since the measurements were in inches, I told them we'd convert it into feet so it would be easier to visualize and model how big the car would be (and figure out whether our results were reasonable). We discuss how to do that (divide by 12) and then I used the yard sticks to model the dimensions we had found. Some students were skeptical of our results, so the next step of our lesson would help us get some answers. Independent Practice: We took our yard sticks out to the faculty parking lot, where I had students measure the height, width and length of my filthy '97 Honda Civic (one student wrote "wash me plz" on the hood) in inches. I also had them carefully and covertly measure a longer car closer to that of the real-life version of the toy car. We returned inside and ran out of time, but we would have figured out the dimensions of a toy car version of my Civic, discussed the reasonableness of our earlier results, and looked at some standardized test-style questions as an assessment. The students really enjoyed this activity, especially because it was so rare for us to just get up and walk out the front door of the school. The novelty of having the toy cars and watching the relevant video was icing on the cake. Some of the students came up with results to their conversions that made no sense, so we discussed them and they quickly discovered and corrected their mistakes. These discussions are as important as anything. It might take two 45-55 minute classes to finish, which is fine. This is a memorable activity, and it's okay to take extra time. I'm always looking for ways to make topics more engaging for my students. Two weeks ago we were studying linear inequalities and their graphs. The focus was on recognizing what each sign meant (what to shade in, solid or dashed line), so I had them use their graphing calculators to identify the line itself. I used a inequality graph matching game from Preparing for TAKS Workbook - Grades 9, 10, 11 , which contained 25 graphs and 25 inequalities that would be cut up into 2 decks of cards. The workbook had convoluted directions for a draw and discard card game which I tried to make sense of and use in my first class that day. It was a disaster. I should have learned from my combining like terms card game not to bury the objective of the game under overly complicated rules (which I later fixed). By the next class, the game was simple: work in groups match all 25 inequalities to the 25 graphs correctly. The first group to match all 25 pairs correctly would receive unspecified goodies. It is amazing how such a simple device could get almost every student engaged--asking each other questions, devising strategies to split up the work, and having spirited debates about who is right. This activity could have easily been a boring worksheet or a series of textbook problems, but the mere sight of these materials is often enough to turn students off. When they saw the two decks of cards, printed on brightly colored card stock, it was a game, it was fun, and ultimately, it was learning. When I checked for understanding using a standardized test question the vast majority of my students had answered incorrectly on the most recent benchmark, it was a piece of cake for them. When we played GRAPH Bingo, students spotted the correct inequalities with ease. It was glorious. This week we were working on understanding slope, y-intercept, and most importantly graphing linear equations. My students are certainly adept at using the graphing calculator to connect graphs, tables and equations, but their reliance on the technology makes them unable to really understand the underlying concepts. If you run into error messages or type in something wrong on the test (i.e. switching a "negative" and "minus" sign), the test administrator can't help you. What do you do then? It can't help you find slope or intercepts if they give you only a graph to look at. What if an equation is given to you that's not in slope-intercept form? The calculators only understand equations that start with "y=", so how do you graph it? How do you find the slope? More importantly, I want them to get so good at doing it themselves that when they do use a calculator, it will be painfully simple. I want to get those "Sir, this is so easy," or "Sir, of course we know how do this already" type of reactions. If they understand what slope and y-intercept means, then it ceases being a jumble of numbers and letters and starts making sense. Slowly, their anxiety and total lack of confidence in their abilities starts to fade away. Once again, glorious. So I adapted the idea from the TAKS workbook and created a linear equation Graph Match game. Students would match 25 graphs with their corresponding linear equations using only their notes; no calculators. Once they believed they had successfully matched all 25, only then could they double check with calculators, thus insuring they would recognize and learn from any mistakes. There was no graphic organizer, nor was there anything to turn in--that would be taken care of the following day. Today, I gave the students the same 25 graphs collected on one double-sided page and asked them to write the equations of all of them. They would still be working sans calculator, although they could use the game cards from yesterday if they felt that would help (only a few students took me up on that offer). There was still a lot of questions, but we made huge strides in these two days. 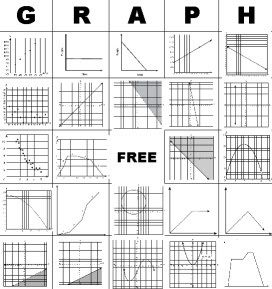 Collect 25 linear graphs from workbooks or other sources. Photocopy, enlarge, and cut and paste them onto as few pages as possible, spacing them out for easy cutting. Keep your master sheets for later. Copy or work out the answers, create a document in your favorite word processor and put them into a well-spaced table that can be easily printed and cut up. Using at least two colors of paper or card stock, copy enough sets of graphs and equations for multiple groups (10 seemed to be more than enough for classes of 25-30). Cut up the cards. Put a deck of graphs and a deck of equations together in small bags (to keep things organized and to allow you to mix them up easily). Use the original master sheets to create the handout for the next day. You could easily use this activity for matching any type of graph to equations and word problems (similar to what we did in GRAPH Bingo as well). In essence, it's a stripped down version of the jigsaw teaching method. Two years ago President Bush convened a National Mathematics Advisory Panel to make suggestions for raising U.S. math proficiency, which lags far behind that of the top countries in the world. As the New York Times summarized last week (Report Urges Changes in Teaching Math), the main thrust of the panel's final report is that math curriculum needs to be streamlined, especially in the lower grades, to focus more on basic skills that students lack when they get to middle school and beyond. That's just part of it. More than half of our Algebra I objectives cover the same material that was tested in 8th grade, and our Algebra II teachers spent the first semester reteaching Algebra I for the same reason. Teachers and students are stuck in this tail spin, and without serious reforms, we'll never reach the level of proficiency we should be seeking as a nation. The lack of basic skills compounds our problems. We don't have time to properly cover Algebra I topics because we're reteaching, and those topics are infinitely more difficult because they're still stuck on mastering basic skills. If I could spend the entire year teaching only Algebra I, we would have more than enough time to reach mastery and properly prepare students for Algebra II (and, in turn, college-level algebra). Our standardized tests are also designed to keep us wallowing in mediocrity. Students are tested on the same material year after year, adding a level of difficulty each time and burying the objective beneath a pointlessly verbose word problem with too many steps. The time spent on benchmarks, preparing for testing, and finally testing itself takes weeks away from instructional time. Throughout the Rio Grande Valley, structuring each year of math (not to mention other subjects) around standardized tests and its particular brand of questioning is closer to the norm than the exception. I'm not saying the tests are too difficult, or that their shouldn't be tests at all--it's how the questions are asked, what is covered in a particular year, and the way these tests are administered. Changes are already starting to happen in Texas, where some of these problems will be addressed by eliminating the current tests and administering more focused end-of-course exams in high school. Since Texas was the model for No Child Left Behind, perhaps this change will affect other states in the future. I only hope that if the report's suggestions become part of the next president' s education policy, they come with serious reforms of NCLB-era testing. You can't have one without the other. I have tried the best I can to prepare students for their May 1st test, get them up to grade level, and prepare them for Algebra II (and ultimately college level math) at the same time. If we don't change the way we teach mathematics, there's no way we'll reach those goals. If you're reading this, and currently on your Spring Break, I am going to assume you aren't traveling anywhere exotic this week. Of course, for many hardworking, underpaid teachers, there's no choice in the matter, due to what my mother would call a severe case of fundsalow. Still more of us want quality time with our families (which, according to my students, consists of 5 wives and 20 children). If you're like me, you're spending your break at home because you too tired or stressed to do anything else. This may be somewhat depressing. Don't fret, homebound revelers: there is still stress relief to be had without much expense or travel. Step 1: Stop reading this post immediately and GO OUTSIDE! I don't think you don't understand quite how pale and unhealthy you look right now. Most teachers I know don't get nearly enough sunlight, fresh air, or exercise; they're stuck in windowless caverns and rarely if ever have the opportunity to walk outside (let alone leave campus) while the sun's still up. More sunlight benefits you physically and helps ward off depression. More importantly, getting outside gives you a great opportunity to get some exercise and play with your family and friends, the benefits of which are immeasurable. So while I can't blame you for wanting to peruse the high quality articles here on I Want to Teach Forever, you need to get out from behind the computer and spend at least part of this break outdoors. Step 2: Engage in small-scale adventures. When I first started teaching at age 21, I had no trouble hopping on planes or driving for 4-7 hours to the nearest major city (unavoidable due to my location in south Texas). My youthful exuberance and newfound financial and physical independence made this easy. As my responsibilities have grown exponentially with my age, so has my desire to do as little as possible during breaks. So what's the alternative? Explore locally. Visit the restaurants, museums, parks or outdoor markets you've been wanting to go to but haven't had the time. Go for a "Sunday drive" to areas of town you've wanted to explore. Get the Friday edition of your local newspaper and find the list of special events and articles about new places and things to do. You might be thinking, "there's no rush for me to do anything, I'm not going anywhere." I used to have this same line of thinking when I was in college, and thus didn't take full advantage of my proximity to New York City, Philadelphia or the Jersey Shore. I regret it every day. FareCompare - Track changes in fares and thus be able to buy at the lowest rate possible. Kayak - A travel metasearch engine, Kayak searches all of the airline websites and the other travel sites like Orbitz and Expedia at the same time. TripAdvisor - I've found they have the most up to date and comprehensive user reviews of hotels and other lodging. If you're really savvy, you can figure out exactly what hotel Hotwire is offering you by comparing the ratings and information with TripAdvisor. Lonely Planet - My favorite series of travel guides has a good online companion with descriptions and reviews of things to do and how to do them. Step 3: Take advantage of the changes in your local public library. Libraries, even small town ones, are keeping up with the times much more than you may think. Most have CDs and DVDs to supplement ample book, magazine and newspaper selections. Some even subscribe to Netflix! They also have internet access (sometimes wireless) and are usually one of the most quiet, calm places you can find in town. What a great place to read, write or create. While you're there, look for a calendar of speakers, workshops and events to attend (usually free) and maybe even clear out some space at home by donating unwanted books. It's there, your taxes pay for it, why not take full advantage of it? Step 4: Engross yourself in your hobby. This is the time to work on your long-neglected projects. For me, it's this website and promoting my book, which while unfortunately still work-related are my passion and outlet. I also write non-teaching related articles for other websites I'm interested in, which helps give more of the separation from work I often need. Of course, your hobby may be radically different, but since you have a few days, you can make some serious progress on whatever you're working on. Indeed, you could start something new, content with the knowledge that even if you don't finish, summer is not that far away. The idea here is to do something you love and recharge those proverbial batteries. Step 5: Most importantly, SLEEP! Speaking of long-neglected things, how about a good night's sleep? If you've been stressed and/or depressed recently, lack of sleep may be a primary cause. All of your systems recharge at night, but it's really your brain that needs that deep REM sleep in order to process all of the information it's received that day. If you don't sleep well, your memory, concentration and mood are all adversely affected. If you've got the time but are having trouble getting on track, try these 10 tips from the Irish Independent. Ironically, I am finishing up this article at 2 am, because I had coffee after dinner tonight. Talk about taking your own advice, huh? Luckily I am off the hook, because since I'm no longer on Spring Break, I'm free to return to the self-destructive routine of the typical classroom teacher. 25 Tips for Less Stress from So You Want To Teach? Yes, I'm giving my book away! See the previous post for more information! Please email me with any questions, comments or concerns. In January I published my first book, Ten Cheap Lessons: Easy, Engaging Ideas for Every Secondary Classroom. It was published under a Creative Commons Attribution-Noncommercial 3.0 Unported license, which means I want people to share it, learn from it, and adapt it to create new ideas of their own. I believe in this so deeply that I'm willing to give five readers the chance to check out the book for free. Email me (teachforever@gmail.com) and tell me who you are, where you're from (city and state), and what you thought of the book. If you like it, pass it on to someone who you think would also like it, and ask them to email me the above information as well. Then they can pass it on to someone else, and so on. If anyone along the way doesn't like it, send it back to me (my return address will be enclosed), and I'll give someone else the chance to try it out. I only need the mailing addresses of the first five readers, so I can ship them the book. After that, I don't want your address. I'm not doing this to build a mailing list, or send junk mail, or for any other nefarious uses of your information. I want to share my ideas and get some constructive feedback. I don't know if I'll ever get these books back, nor do I care--that's sort of the point. I'm calling this experiment Ten FREE Lessons! If you're interested, email me with your name and address (or questions or concerns you may have). I'll accept the first five requests I receive (if there's a huge response, perhaps I can send more), and we'll see just how far Ten Cheap Lessons can go. Thank you! So I decided we'd play BINGO, using a board made up entirely of graphs. There are plenty of resources available online to create bingo cards for free, but I couldn't find one that did what I wanted it to do (the closest was this picture bingo card maker at ESLactivities.com). I was cutting and pasting from the PDF files to a Word document, not creating individual image files, so I had to make it myself. All of the graphs were pulled from TAKS released tests from Grade 8, 9, 10 and 11 and the 9th grade TAKS Study Guide. The graphs are informally grouped together, and I manually moved graphs and columns around to create 20 different cards. The game is played like regular bingo, 5 in a row across, down or diagonally with a "free" space in the middle. The call sheet contains each graph and a verbal descriptions of it. I wrote each description on my document camera (the 21st century overhead projector) and repeated it verbally as well, and then students worked alone or in groups of 2-3 to identify the correct graph. Instead of yelling out "BINGO!" students yelled "GRAPH!" and I verified their results. We were able to play 2 games in 45 minutes. I guided students as much as possible through the first game, but then left them on their own for the second. They enjoyed it, were engaged (even with Spring Break looming) and most importantly had a clear grasp of the material. I used highlighters as markers, which means the boards couldn't be reused. This was a pain, but better than the alternative. I've done different versions of bingo in class for years, and no matter what I used for markers--actual bingo chips, pinto beans, candy--students would throw them at each other, steal them and create a huge mess. By having them work in small groups, there were enough cards left over that I only needed to print the 20 for each class. For more games and good ideas, check out my book! After Wednesday's TAKS Reading test, I tried to make Thursday as easy as possible while still making sure we learned something. Most students had finished most or all of our Newspaper Math group work on Tuesday, but I wanted to follow up with more work on interpreting data graphs. What's the independent and dependent variables? What's the trend/pattern/correlation/main idea of the data graph? Based on the data, which of the following statements is true/a valid conclusion? Which graph accurately reflects the given data? I hope you don't dismiss this as just another worksheet, because in truth I only posted this for use as an example. 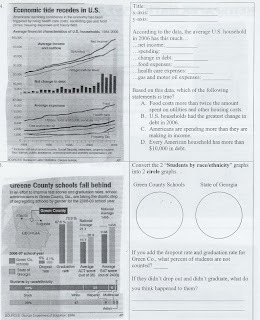 My students were a bit more invested in this than your standard issue work because the graphs were pulled from the local newspaper, I wrote the questions myself, and they are asked a variety of questions in a variety of ways. It took about an hour to find the graphs and write up appropriate questions. We also talked about why we need this skill before we started, and I showed them six different questions from their last benchmark where they could use these data graph analysis skills to answer them correctly. Six questions is about a ten percent swing on that test, which is the difference between passing and failing for many students on the bubble. (A) The student describes independent and dependent quantities in functional relationships. (D) The student represents relationships among quantities using [concrete] models, tables, graphs, diagrams, verbal descriptions, equations, and inequalities. (E) The student interprets and makes inferences from functional relationships. (C) The student interprets situations in terms of given graphs [or creates situations that fit given graphs]. (D) In solving problems, the student [collects and] organizes data, [makes and] interprets scatterplots, and models, predicts, and makes decisions and critical judgments. (B) Given situations, the student looks for patterns and represents generalizations algebraically. (C) construct circle graphs, bar graphs, and histograms, with and without technology. (B) recognize misuses of graphical or numerical information and evaluate predictions and conclusions based on data analysis. More posts tagged with "newspaper"
For more ideas on using the newspaper in the classroom, check out my book Ten Cheap Lessons: Easy, Engaging Ideas for Every Secondary Classroom. Email me or leave a comment if you have more ideas to share.